Rory McIlroy with the West of Ireland trophy in 2006Rory McIlroy looks certain to join golf’s million euro club after scorching into contention for his maiden victory in the Barclays Singapore Open. But the Holywood teenager, 19, is more interested in earning a priceless US Masters invite with a top finish in the weather-affected Asian Tour event. Just two shots behind leaders Ernie Els and Simon Dyson on four-under par after a second round 68, McIlroy said: “It's a fantastic achievement and of course, it's a lot easier than it was a decade ago. “Though it's nice to reach such a milestone, I'm pinching myself to think that I'm not yet 20 and I could earn that much money on the golf course." McIlroy turned pro in September last year and needs just a top 40 finish in Singapore to pass the million euro barrier in career earnings. But he's got his sights set on a victory that would catapult him into the world's top 50 and next year's Masters at Augusta National. He explained: “It would be nice to get that Christmas gift of a first invite into the Masters. I'm 80th in the world right now and a great result in any of my four remaining events this year should get me into the top-50 and also into Augusta. "I'm still your normal 19-year old but I’ve matured a lot by travelling the world, playing golf with older players and meeting sponsors and dignitaries that other 19-year olds would not have access to. “It's pretty nice really to have earned nearly a million euro - but it's not the prize money that is motivating me. It's still a first win and a continued climb up the world rankings." McIlroy has invested most of his earnings in his bachelor pad in Bangor and while he doesn’t plan to splash out on a new car until he wins his first title, he's right on track to achieve that goal in the weather affected Asian Tour event. Resuming his first round at one over after 14 holes, an eagle at the 18th helped him finish with a one-under 70. 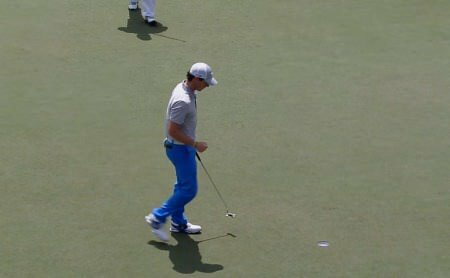 Teeing off on the back nine in the second round, McIlroy fired an eventful 68 that featured an eagle at the seventh, a double-bogey on the par-three eighth and birdie at the ninth to share third place with Chapchai Nirat on four-under. Padraig Harrington and Darren Clarke failed to finish their second rounds as torrential rain affected play at Sentosa Golf Club. Harrington will resume play seven shots off the pace after playing his first six holes in level par with Clarke ten strokes adrift on four over after just three holes on his second round. Rory McIlroy will tee it up with defending champion Trevor Immelman in the third round of the Masters after officials decided he had not incurred a penalty for kicking the sand in a bunker during an incident-packed second round 73. Boy wonder Rory McIlroy turned Augusta National into his personal playground to grab the Masters lead with a sensational seven under 65. The 21-year old world No 9 fired seven birdies in what turned out to be the only bogey free round of a perfect day before he was joined in a share of the lead by Alvaro Quiros in the last group of the day, finishing the first round two strokes clear of Korean duo YE Yang and KJ Choi.